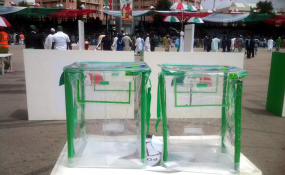 Nigerians who travelled to other places to vote in the presidential and National Assembly elections have narrated how the postponement of the elections affected their financial plans. The Independent National Electoral Commission at about 2:45 a.m on Saturday announced the shift of the elections by seven days, citing challenges with logistics. According to the INEC Chairman, Mahmood Yakubu, the challenges include delays in delivering ballot papers and result sheets, occasioned in part by flight challenges due to bad weather. In various interviews with PREMIUM TIMES, the Nigerians said the postponement had a negative effect on their financial plans for the month. They hoped the new dates fixed by INEC for the elections are sacrosanct. The voters who were mostly married men, also said they travelled without their wives, for financial and other reasons. Others who regarded themselves as lucky voters said they had registered in nearby states and were planning to travel early morning until they heard the announcement. "I am from Gabu ward in Yala Local Government Area of Cross River State. I had left Abuja with four of my friends who also travelled to other states like Rivers and Delta where we did our registration and collected our PVCs," said Benjamin Ogede. "For my journey alone, the transport to my place apart from local fares cost about N9,000. From Abuja to Ogoja was N6,500. From Ogoja which is my local government area to Gabu was about N2,000. This is excluding other local expenses. "I left my family in Abuja so that they are not in any way affected during this election period. In all, I can say I incurred about N50,000 for everything. This includes the cost of my trip back because I must travel back first thing tomorrow (Sunday) to return to work. I work with the Ministry of Niger-Delta and we had received a circular saying we were given Friday and Monday as days off for the elections, that was how I was able to come in the first place." Mr Ogede said he felt a bit disappointed about the postponement, but added that he believes INEC would not have taken the decision without a good reason. Another civil servant who simply identified himself as Simeon said he flew from Abuja to Port Harcourt in Rivers State. "The cost of this postponement can never be quantified in real terms. It is beyond what we can just explain. I purchased a return ticket for N66, 000 from Abuja. When I add the other expenses within town and what it cost to settle villagers and family members during such trips, we are talking about over N100, 000. "What about the time spent? The many other inconveniences? The effect is just enormous," Mr Simeon said. The voter said he had travelled to his country home in Amaku/Igbodo ward of Etche Local Government Area of Rivers State. Haggai Nok, who hails from Jaba Local Government Area of Kaduna State, said he budgeted N6,000 for an early morning trip to Nok, where his ward is situated, early Saturday. Mr Nok, however, said he cancelled his journey when he received a message at 4 a.m on Saturday that the elections were postponed. "I had planned to travel on Friday evening but unfortunately I couldn't make it. I rescheduled the journey for Saturday morning since it is a journey of two hours. "But I was surprised when I learned the election had been postponed. "The first question I asked myself was: is the country safe? Based on security issues, most especially the fact that there were reported killings in Kaduna State, I just prayed and continued sleeping," said Mr Nok who works with the United Bank for Africa (UBA). Various reactions have trailed the postponement of the election, with many describing it as a clear indication of INEC's inadequate preparation. Others also regarded the problem as a consequence of Nigeria's failure to strengthen the electoral commission. Political parties, especially the main opposition Peoples Democratic Party and the ruling All Progressives Congress also blamed each other for the development, alleging plots to manipulate the elections. In these reactions, lawyers also expressed different opinions on the constitutionality of INEC's postponement of the elections. Some of the lawyers who spoke with Premium Times said INEC acted within its powers but others described the postponement as an abuse of INEC's powers. "INEC has the power to regulate and control the conduct of the elections without recourse even to the federal government. The law requires INEC to be independent in carrying out its statutory mandate, especially in an election where the incumbent executive is also a candidate," an Abuja based lawyer, Folarin Aluko, said. "INEC has the exclusive jurisdiction to make rules and regulations to govern the conduct of the pre-election activities as well as the elections proper. On the issue of the conduct of the elections, Section 25 of the Electoral Act prescribes the order in which elections into the Executive and Legislative arms of government should be conducted. INEC is exclusively empowered to determine the days on which the elections are to hold. "More significantly, Section 26 of the Electoral Act gives INEC the power to postpone the holding of an election for security reasons, natural disasters or other emergencies. The reasons must be cogent and verifiable. "The law, however, mandates INEC to appoint another date for the elections," Mr Aluko said. In a different opinion, a senior advocate of Nigeria, Femi Falana, described the postponement of the election as unlawful. In an interview, earlier granted to another medium and provided to this newspaper upon a request to speak with him, Mr Falana said the provisions allowing postponement of elections were very clear and did not include the reasons alluded by INEC. "By virtue of section 26 of the Electoral Act, an election can only be postponed if a serious breach of peace or violence is likely to occur or on account of a natural disaster or other emergencies. To prevent any abuse of power, the reasons for postponement must be cogent and verifiable. "Furthermore, section 105 of the Constitution of Nigeria provides that if the federation is at war in which the territory of the country is physically involved and the President considers that it is not practicable to elections the national assembly may pass a resolution to postpone the election. "And such postponement shall not be more than six months at any one time. Therefore, I can say, without any fear of contradiction, that there is no legal basis for shifting elections in Nigeria on grounds of logistical and operational inadequacies," Mr Falana said. INEC has slated February 23 for the presidential and National Assembly elections. Those for governorship and state Houses of Assembly seats were also moved forward by one week to March 9.